Undeniably the most iconic of Hong Kong’s rocks, Devil’s Fist is a jubilant hand rising from the waves, conjuring up images of mythical sea giants. Weathering and erosion have sculpted out some hardy knuckles and a slender wrist, making it an easily-identifiable feat of the seas. Visit at low tide to ensure optimum wrist visibility. One of the more popular in our line-up, Lover’s Rock is frequented by women facing relationship problems. This phallic monolith protrudes from Hong Kong’s hills and legend holds that pilgrimage to the rock brings both happy marriage and fertility. Expect big crowds during the Maidens’ Festival in August. Thought Tai O was just fishing, stilt houses and seafood? Think again. Its unmissable highlight has to be Old Man Rock, the stone embodiment of a war general. The horizontal general even has a convincing war wound where his sandstone leg has eroded. While this general might look vulnerable and kind, be warned, he’s got a heart of stone. As one might expect, Lion Rock bears an uncanny resemblance to a crouching lion. Standing majestically atop a 495m peak, the notorious rock challenges its visitors with a steep and arduous climb. The celebrated lion inspired the roaringly successful TV series, Below the Lion Rock and was the subject of its popular eponymous theme song. More recently, in October, Lion Rock became the face of the pro-democracy campaign, and, with the help of a 28m banner proclaimed, ‘I want real universal suffrage’. 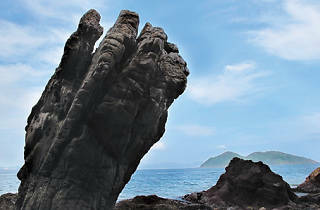 The Ninepin Islands are famous for their extraordinary hexagonal rock columns. The curious patterns of this rhyolite – a type of igneous rock – are the result of a volcanic eruption near Sai Kung about 140 million years ago. While the islands cannot be reached by public transport, they can be accessed via private boat – but prepare for a rocky ride. The most delicate of our rocks, Amah Rock resembles a bereaved woman with a child on her back. Her story is one of love and fidelity. The woman kept watch every day for her husband’s return from sea, unaware that he had drowned. The Goddess of the Sea turned the woman into a rock so that her spirit was free to join with that of her husband. Find the woman gazing out over Sha Tin, in search of her absent husband. This crescent-shaped island, known for its strange rock formations, features some of the earliest examples of sedimentary rock in Hong Kong. Contain yourselves rock-lovers, you’ll be spoilt with an array of siltstone, mudstone, dolomitic siltstone and chert. Allow plenty of time to reach the island though, as it’s right in the far northeast, close to Guangdong. Hong Kong’s southernmost island, Po Toi, is every rock enthusiasts’ dream playground. Our favourite on the island is the huge Buddha Hand Rock signalling out to sea. Take note of exemplary detailing on this stone mudra, right down to individual fingernails. While on the island also keep an eye (or two) out for the Supine Monk, the Coffin Rock and the Tortoise Climbing up the Mountain. A rare treat to the eye, there are over 100sq km of hexagonal rock columns to gawp at on High Island. 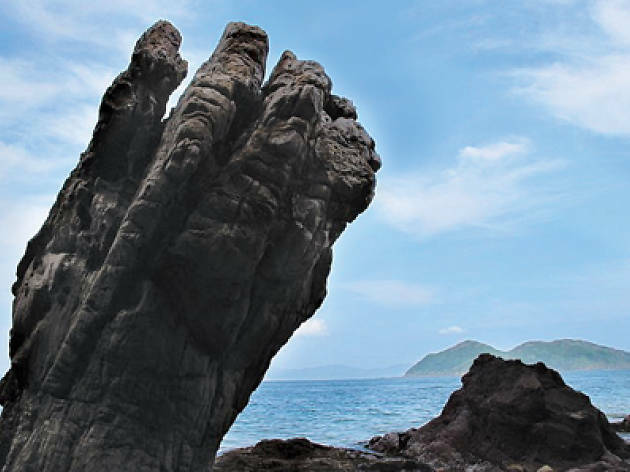 These impressive formations are part of Sai Kung’s volcanic rock region and have become a hot spot for tourists and locals. You’re guaranteed not to come away stony-faced.